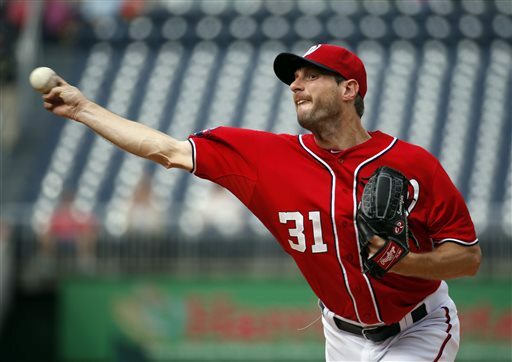 Max Scherzer threw a no hitter into the 8th and finished with 8 innings, 2 hits, 1 run, 3 walks and 10 strikeouts, giving the Nationals a controversy free 5-1 decision over the Reds. Matt den Dekker got 3 hits, including a homer, driving in 2 and scored 2 in Washington’s 5-1 victory over Cincinnati. Marco Estrada pitched into the 8th inning, settling down after some early trouble to finish with 7 1/3 innings, 4 hits, 3 runs and 1 walk. He did not get the decision but helped set up Toronto’s 4-3 win over the Orioles. Jackie Bradley Jr. reached base 3 times, including a 2 run homer, driving in 3 and stealing a pair of extra base hits away with his defense as the Red Sox topped the Yankees 5-1 and delayed a post season clinching for their rivals for at least a day. Earning 1/2 WOBs on losing efforts. J. A. Happ allowed 1 hit and no walks over 6 shutout innings. He did not get the decision in the Pirates heart breaking 3-0 loss to St. Louis. Andre Ethier got a pair of hits and drove in the tying run in the 9th inning but the Dodgers fell to San Francisco in the 12th inning, 3-2. Yordano Ventura was perfect through 5, finishing with 7 shutout frames, allowing 2 hits, 1 walk and striking out 6. He would not get a decision as the Cubs walked off 1-0 winners in the 11th. Prince Fielder singled, doubled and homered, driving in 4 but the Rangers came up short to Detroit, 7-4. 2015 WOB Totals for Players Who Changed Leagues,. Our Lead Podcast Personality – Paul Francis Sullivan – (feel free to call him ‘Sully’), keeps a running total for the yearly leaders and we will updatethe standings here every day. Posted on September 29, 2015, in 'SullyMetrics' and tagged a.j. burnett, a.j. pierzynski, a.j. pollock, Aaron Altherr, Aaron Brooks, aaron harang, aaron hicks, aaron nola, aaron sanchez, abraham almonte, Adam Conley, Adam Eaton, adam jones, adam laroche, adam lind, adam wainwright, adam warren, addison russell, adeiny hechavarria, Adonis Garcia, adrian beltre, adrian gonzalez, albert pujols, alec asher, alejandro de aza, Alex Colome, alex gordon, alex rodriguez, alex wood, alexei ramirez, alexi amarista, alfredo simon, andre ethier, andrelton simmons, Andrew Cashner, Andrew Heaney, Andrew McCutchen, andrew romine, angel pagan, anibal sanchez, Anthony DeSclafani, anthony ranaudo, anthony recker, anthony rizzo, aramis ramirez, Asdrubel Cabrera, austin jackson, avisail garcia, bartolo colon, ben revere, Billy Burns, billy butler, BIlly Hamilton, brad hand, brad miller, brandon belt, brandon crawford, Brandon Guyer, brandon morrow, brandon moss, brandon phillips, brett anderson, brett gardner, brett lawrie, Brian Dozier, Brian McCann, brock holt, Bryan Mitchell, Bryan Pena, bryce harper, buster posey, byron buxton, c.j. cron, c.j. wilson, carlos beltran, Carlos Carrasco, carlos correa, Carlos Frias, carlos gomez, carlos gonzalez, Carlos Martinez, carlos rodon, Chad Bettis, charlie blackmon, charlie morton, Chase Anderson, chase headley, chase utley, chi chi Gonzalez, chris archer, Chris Bassitt, chris carter, chris coghlan, Chris Colabello, chris davis, Chris Heston, chris iannetta, chris johnson, Chris Owings, chris rusin, chris sale, Chris Tilman, chris young, christian yelich, clay buchholz, clayton kershaw, Clint Robinson, coco crisp, Cody Anderson, Cody Asche, colby lewis, colby rasmus, Cole Gillespie, cole hamels, collin mchugh, Corey Dickerson, Corey Kluber, corey seager, Cravy, curt casali, curtis granderson, dallas keuchel, dan haren, dan uggla, daniel murphy, daniel nava, Daniel Norris, Danny Duffy, Danny Salazar, danny valencia, darin ruf, david freese, david ortiz, David Peralta, david phelps, david price, david ross, david wright, dee gordon, Derek Holland, derek norris, Devon Travis, Dexter Fowler, didi gregorius, dioner navarro, dj lemahieu, Domingo Santana, drew hutchinson, Drew Smyly, dustin pedroia, Eddie Rosario, edinson volquez, eduardo escobar, Eduardo Rodriguez, edwin encarnacion, elian herrera, Ender Inciarte, Enrique Hernandez, Erasmo Ramirez, eric hosmer, erick aybar, ervin santana, evan gattis, evan longoria, Ezequiel Carrera, felix hernandez, francisco cervelli, Francisco Lindor, francisco liriano, franklin gutierrez, freddie freeman, Freddy Galvis, garrett richards, george springer, gerardo parra, gerrit cole, giancarlo stanton, gio gonzalez, Greg Garcia, hanley ramirez, hector santiago, Henry Owens, hisashi iwakuma, howie kendrick, hunter pence, ian desmond, ian kinsler, ike davis, j.a. happ, j.d. martinez, j.p. arencibia, j.r. murphy, J.T. Realmuto, Jace Peterson, Jackie Bradley Jr., Jacob DeGrom, jacoby ellsbury, Jaime Garcia, jake arrieta, jake odorizzi, jake peavy, Jake Smolinski, james loney, james mccann, james paxton, jarred cosart, Jarrett Parker, Jason Bourgeois, jason hammel, jason heyward, jason kipnis, Jason Rogers, jay bruce, jayson werth, jean segura, jedd gyorko, jeff locke, Jeff Samardzjia, Jerad Eickhoff, jered weaver, Jeremy guthrie, jeremy hellickson, jesse chavez, Jesse Hahn, Jimmy Nelson, jimmy paredes, jimmy rollins, Joc Pederson, joe kelly, joe mauer, Joe Panik, Joe Ross, joey votto, JoHector Gomez, john danks, john lackey, John Lamb, john mayberry Jr., johnny cueto, Johnny Giavotella, jon gray, jon lester, jon niese, jonathan lucroy, Jonathan Villar, jordan schafer, jordan zimmermann, jorge de la rosa, jorge soler, jose abreu, jose altuve, jose bautista, Jose Iglesias, jose quintana, jose reyes, josh collmenter, josh donaldson, josh hamilton, josh reddick, Josh Tomlin, juan lagares, juan uribe, julio teheran, justin smoak, justin turner, justin upton, justin verlander, Kelby Tomlinson, kelly johnson, Kendall Graveman, kendrys morales, kevin gausman, Kevin Kiermaier, Kevin Pillar, Khris Davis, kirk nieuwenhuis, kole calhoun, kolten wong, kris bryant, kris medlen, kurt suzuki, kyle blanks, kyle gibson, Kyle Hendricks, kyle kendrick, Kyle Lobstein, kyle lohse, Kyle Ryan, kyle schwarber, kyle seager, lance lynn, lance mccullers, leonys martin, logan morrison, lorenzo cain, lucas duda, luis severino, luis valbuena, madison bumgarner, Maikel Franco, manny machado, Manny Parra, marcell ozuna, Marco Estrada, Marcus Semien, marcus stroman, mark buehrle, Mark Canha, mark reynolds, mark teixeira, mark trumbo, marlon byrd, Martin Maldonado, martin perez, martin prado, masahiro tanaka, mat latos, Matt Adams, matt carpenter, Matt Den Dekker, matt duffy, matt harvey, matt holliday, matt joyce, matt kemp, matt moore, Matt Shoemaker, max scherzer, melky cabrera, michael bourn, michael brantley, michael cuddyer, michael mckenry, michael pineda, michael wacha, miguel cabrera, miguel gonzalez, miguel montero, miguel sano, mike aviles, Mike Bolsinger, mike fiers, Mike Leake, mike montgomery, mike moustakas, mike napoli, mike pelfrey, Mike Trout, Mike Wright, mikie mahtook, mitch moreland, Mookie Betts, nathan eovaldi, Nathan Karns, neil walker, nelson cruz, nick ahmed, nick castellanos, nick hundley, nick martinez, Noah Syndergaard, nolan arenado, nori aoki, Odrisamer Despaigne, Odubel Herrera, Patrick Corbin, paul goldschmidt, pedro alvarez, phil hughes, Preston Tucker, prince fielder, r.a. dickey, Raisel Iglesias, Ramon Cabrera, Randal Grichuk, randy wolf, rich hill, rick porcello, roberto hernandez, robinson cano, Roenis Elias, Rougned Odor, rubby de la rosa, ruben tejada, rusney castillo, russell martin, ryan braun, ryan flaherty, ryan howard, ryan vogelsong, ryan zimmerman, scooter gennett, scott baker, scott feldman, scott kazmir, scott van slyke, seth smith, shane greene, Shawn O'Malley, shelby miller, shin-soo choo, sonny gray, starlin castro, stephen drew, Stephen Piscotty, stephen strasburg, stephen vogt, steve pearce, Steven Matz, Steven Souza Jr., steven wright, taijuan walker, taylor jungmann, Thomas Pham, tim hudson, tim lincecum, todd frazier, tom koehler, tommy milone, Tommy Pham, Torii Hunter, travis d'arnaud, Travis Ishikawa, Travis Shaw, travis wood, trevor bauer, trevor plouffe, troy tulowitzki, tsuyoshi wada, Tyler, Tyler Duffey, tyson ross, ubaldo jimenez, Vidal Nuno, wade miley, wei-yin chen, welington castillo, wil myers, wilin rosario, Wilmer Flores, Wilson Ramos, xander bogaerts, yadier molina, yan gomes, Yangervis Solarte, yasiel puig, yasmani grandal, yasmany tomas, yoenis cespedes, Yohan Flande, yonder alonso, Yordano Ventura, yovani gallardo, yunel escobar, Zach Davies, zack cozart, zack greinke. Bookmark the permalink. 2 Comments.